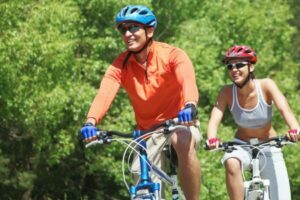 Every year, about 25,000 Americans are admitted to the hospital with bicycle-related concussions and other traumatic head injuries. Although there are many strategies cyclists can use to stay safe on the road, the best way to avoid concussions is to make sure you wear a high-quality helmet whenever you ride. Not all helmets are created equal, and a new design technology that’s being pioneered by Trek could soon change the way these life-saving devices prevent concussions. Earlier this month, the company unveiled a series of helmets that rely on an innovative material called WaveCel to absorb energy in impacts. Unlike most helmets that utilize Expanded Polystyrene (EPS) to prevent head injuries, Trek’s WaveCel helmets are outfitted with honeycomb-style inserts that mimic the behavior of the cerebrospinal fluid found in the brain. This fluid serves as the brain’s natural cushioning system, absorbing rotational energy to prevent nerve damage. The inserts in Trek’s WaveCel helmets work in much the same way, absorbing impact energy rather than simply redistributing it as most modern helmets do. Trek’s WaveCel helmets can’t completely eliminate concussion risks for cyclists, but preliminary studies studies have already shown that the company’s new helmets are more effective at preventing brain injuries than traditional EPS helmets. Best of all, the WaveCel helmets aren’t much more expensive than other current high-end options, with prices starting at around $150. At Nantucket Bike Shop, we can help you find a great new helmet that meets your budget and suits your riding style. Just stop in or give us a call at our toll-free number to get started today!